Two of us took on the allotment when the children were small and we needed our escape, neither of us being the types to do ‘lunch’ or ‘retail therapy’. We had the choice of 80%+ of the plots, as in those days they were not so popular, and were all covered in brambles. Our ‘farm’ soon grew into a bit of a women’s cooperative as many others needed their space too and we were even on the telly – good times and good friendships! The older plotholders tended to be retired gents who kindly imparted their knowledge and surplus seedlings – one in particular Mr McCrone, the gentlest and kindest man who is also a beekeeper and became my mentor. 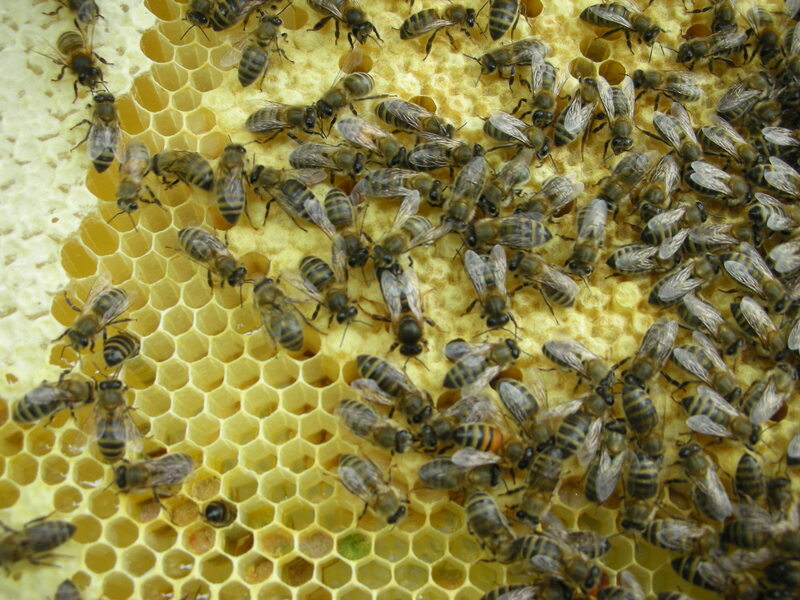 Then came the bees – they arrived as the beekeeper’s had to find a new apiary – so a friend and I thought beekeeping a good progression, the bees have somewhat taken over, as with the creation of BeeInspired developing, making and marketing the creams we make with our honey and Beeswax. 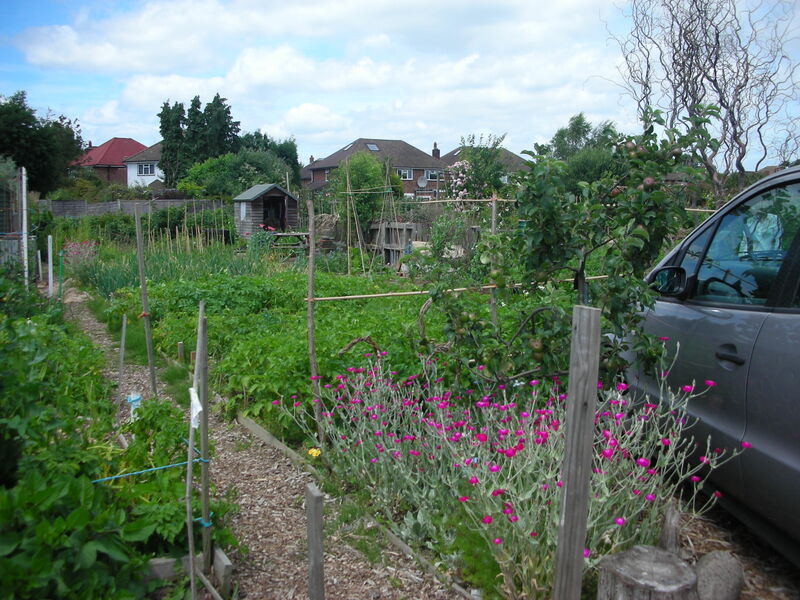 Back to the allotment; in the early days it was a sanctuary from busy lives and society today, we kept ourselves to ourselves with a few nods and conversations. In the early days the Council sold off a half plot to householders along the boundary and built a small track, and coincidentally mares tail started creeping across the plots, it took about 10 years to get to us and the next 10 to march all the way across. At the same time the council passed the running over to the plot holders , having been so neglected they have slowly improved and in recent years, with the upsurge of interest are now almost 100% tended. We inherited a thornless blackberry and some rhubarb which we’ve maintained and enjoyed. Husband to first allotment buddy built us a shed (much frowned upon by old guard) but needed for calls of nature and we planted a couple of trees – not allowed – but the rule has now changed and fruit trees now permitted with my lovely neighbours planting a small orchard. The more I think about what we have planted and what we have cropped in the past the more bereft I feel! I love seeing the creativitiy of sheds and plot designs most usually made out of recycled materials – so often quirky – and meeting the folk that create them – and the liberation to try it out on the plot without it being judged – it’s all fun! We’ve grown and enjoyed almost ever vegetable with my very most favourites have being sweetcorn and blackcurrants. The tenderness and sweetness of the corn when freshly harvested can’t be beaten. Blackcurrant bushes are so sturdy and smell of the fruit when you walk by – so fresh and delicious – we always make cassis with the fruit and add honey – the best winter toddy I can think of. Coming from Cumbria we planted a damson tree a few years ago – for damson jam and gin – the sweet/tart combination can’t be beaten. I’m now thinking of all the other things I’ve loved cropping and it makes me even more sad! Leeks were another favourite as the were so simple to grow – just needed weeding! I always intended planting to the moon, bought a couple of books but could never quite get my head round the planning! Planning what and where to plant was fun too – always starting with the best of intentions and most often falied miserably. In the early days it didn’t matter but recently one felt that one was being watched and judged. Weeds are anti social, with seeds blowing onto neighbours’ plot, and there too I failed and cannot believe that this year everything is cocooned in ‘sticky willy’ – another good ingredient for our creams. In retirement, if ever, I can go back when I have more time (an unattainable dream I fear). Not looking forward to clearing the plot but we’ll be going down over the next few weeks to crop the blackcurrants and damsons, dig out a few bushes to squeeze into the garden and remove valued tools but the majority will be left for the new plotholder – passing on as it were……………. I thought I could categorise each blog under a subject type to make it easier for people to read and find useful info – I’ve obviously got a lot to learn! we were hacked on Twitter today and I felt violated and embarrassed and hope too many people weren’t very cross – we told the bees and they threatened to sting anyone else who hacks us – so there be a warning to you wastrels!